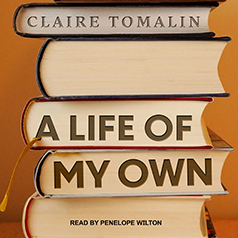 From steemed biographer and legendary literary editor Claire Tomalin, a stunning memoir of a life in literature. In A Life of My Own, the renowned biographer of Charles Dickens, Samuel Pepys, and Thomas Hardy, and former literary editor for the Sunday Times reflects on a remarkable life surrounded by writers and books. From discovering books as a form of escapism during her parents' difficult divorce, to pursuing poetry at Cambridge, where she meets and marries Nicholas Tomalin, the ambitious and striving journalist, Tomalin always steered herself towards a passionate involvement with art. She relives the glittering London literary scene of the 1960s, during which Tomalin endured her husband's constant philandering and numerous affairs, and revisits the satisfaction of being commissioned to write her first book, a biography of the early feminist Mary Wollstonecraft. In biography, she found her vocation. However, when Nick is killed in 1973 while reporting in Israel, the mother of four put aside her writing to assume the position of literary editor of the New Statesman. Her career soared when she later moved to the Sunday Times, and she tells with dazzling candor of this time in her life spent working alongside the literary lights of 1970s London. But, the pain of her young daughter's suicide and the challenges of caring for her disabled son as a single mother test Claire's strength and persistence. It is not until later in life that she is able to return to what gave her such purpose decades ago, writing biographies, and finds enduring love with her now-husband, playwright Michael Frayn. Marked by honesty, humility, and grace, rendered in the most elegant of prose, A Life of My Own is a portrait of a life, replete with joy and heartbreak. With quiet insight and unsparing clarity, Tomalin writes autobiography at its most luminous, delivering an astonishing and emotionally taut masterpiece.